The tide of people moving across the world, be they immigrants or refugees, has sparked concern in Australia, Europe and the United States. In particular, the ethnic, linguistic and cultural background of migrants has triggered intense debates over the benefits and the costs of growing diversity and the risk of open borders to national identity. Unease over the cultural, economic and security ramifications of immigration helped to fuel the Brexit vote in the United Kingdom, encourage the idea of a wall along the U.S.-Mexican border and broaden support for right-wing populist parties in France, Germany and the Netherlands. Across the countries surveyed, there are significant differences in how the youngest and oldest generations view national identity. In the U.S., people ages 50 and older (40%) are more likely than those ages 18 to 34 (21%) to say it is very important that a person be born in the country to be considered truly American. In Japan, the generational divide is even more pronounced: Older Japanese are more likely than their younger counterparts to link national identity to birthplace by a 59% to 29% margin. Generational differences, though generally more modest, are also evident in Australia and Canada (15 percentage points each), and across most European countries surveyed. The generations differ even more sharply over the importance of national customs and traditions. In the U.S., people ages 50 and older (55%) are far more likely than those ages 18 to 34 (28%) to say sharing such cultural elements is very important to being truly American. There is a similar 20-percentage-point generation gap in Canada, Australia and Japan. In Europe, a median of 37% of 18- to 34-year-olds believe this aspect of national identity is very important, compared with 56% of those ages 50 and older. In many countries, the debate over national identity is a partisan one. 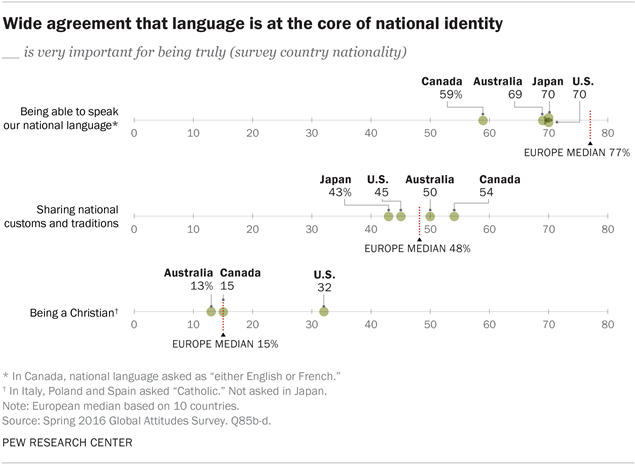 In the U.S., more than eight-in-ten Republicans (83%) say language proficiency is a very important requisite for being truly American. Fewer independents (67%) share that strong belief and even fewer Democrats (61%) agree. Among Republicans, 60% say that for a person to be considered a true American it is very important that he or she share U.S. culture. Only 40% of independents and 38% of Democrats agree that this is very important to being truly American. A clear partisan split in the U.S. also exists on the importance of being Christian. 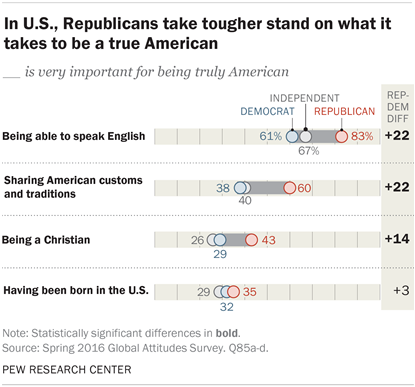 More than four-in-ten Republicans (43%) say it is a very important part of being an American. Fewer Democrats (29%) and independents (26%) share this view. Notably, there is not much partisan difference about the link between the land of one’s birth and U.S. national identity. Roughly a third of Republicans (35%) and Democrats (32%) say being born in the U.S. is very important. Slightly fewer independents (29%) hold that view. Views of what constitutes national identity also divide publics along party lines in some European countries. In the UK, 73% of those who have a favorable opinion of the right-wing UK Independence Party (UKIP) say adhering to British culture is very important to being British. Just 44% of those who have an unfavorable view of UKIP agree. In France, sharing French customs and traditions is tied to national identity for those who have a favorable view of the right-wing, populist National Front (FN) (65% say it is very important). Just 39% of those who hold an unfavorable opinion of the FN strongly link culture to being truly French. There is a similar 24 percentage-point difference on the importance of Swedish customs and traditions between sympathizers with the right-wing, populist Swedish Democrats and those who see them unfavorably. And in Germany there exists a 22-point gap on the importance of culture between those who favor the Alternative for Germany party and those who don’t. In Australia, roughly eight-in-ten (79%) supporters of the center-right Liberal Party and about seven-in-ten (68%) backers of the center-left Labor Party say it is very important to speak English to be considered Australian. Only a third of the left-leaning environmentally oriented Greens agree. There is even greater partisan disparity on the importance of customs and tradition. More than six-in-ten Liberal Party followers (63%) believe that adherence to Australian customs and traditions is very important to national identity. Just over four-in-ten Labor Party supporters concur (44%). And even fewer Greens agree (15%).percentage-point difference on the importance of Swedish customs and traditions between sympathizers with the right-wing, populist Swedish Democrats and those who see them unfavorably. And in Germany there exists a 22-point gap on the importance of culture between those who favor the Alternative for Germany party and those who don’t. In Canada, while majorities across all major parties say it is very important to speak either French or English, this sentiment is held most strongly by those supporting the center-right Conservative Party of Canada (68%), followed by those backing the center-left Liberal Party (59%) and those supporting the social-democratic New Democratic Party (53%). More than six-in-ten Conservatives (63%) believe that a person must share Canadian customs and traditions to be truly Canadian. Fully 57% of Liberals agree, but only 46% of New Democrats share this view. Relatively few Canadians aligned with any of these major parties think it is very important to national identity to be Christian or to be born in Canada.